Since 1998, Prairie Senior Cottages has led the way in creating small, intimate senior-living communities specializing in caring for seniors with Alzheimer’s disease and related dementias. Our Cottages help stimulate the mind, while providing a unique and welcoming spirit that feels like home. The result is innovative households, nestled in a picturesque setting that encourage family visits and allow residents to safely enjoy the outdoors. 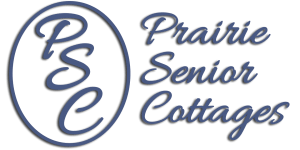 Prairie Senior Cottages believes that those experiencing memory loss benefit from living in a true home environment with traditional floor plans and furnishings. The familiar environment is comfortable and relaxing with both single and double occupancy floor plans available. For safety and social reasons, all cottages are communal facilities. Although some assisted living facilities offer apartments with private bathrooms and kitchens, Prairie Senior Cottages believes unsupervised access to these areas is unsafe for those with dementia. In addition, we believe sharing a kitchen, dining room and living room with other residents and staff has important therapeutic benefits. Regular social interaction also prevents the isolation that so easily occurs.